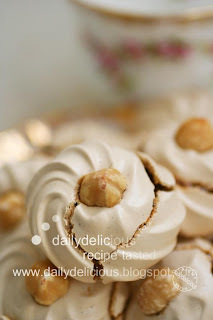 dailydelicious: Bitter sweet meringues: Hazelnut Coffee Meringues, what a great combination! 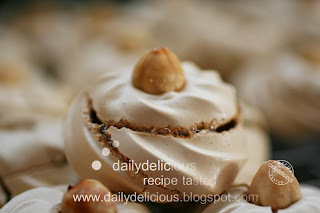 Bitter sweet meringues: Hazelnut Coffee Meringues, what a great combination! It's just because I made a lot of ice cream, pastry, vanilla cream, well, a lot of anything that use only egg yolks, the result is a big box of egg whites in my fridge. So, I had a little problem ^ ^". But the macaron is not something that I can have everyday (well, and I don't in the mood of making it too, haha). So I need something easy and delicious to use the egg whites, something that everyone will love it. After a bit of browsing through the books, I got this idea, the coffee flavored meringue with the hazelnut from one of my book. But after making this cookie followed the method in the book, the result is not great, the cookie is not as crisp as I want. So, I turn to follow the old method that I like, "The Swiss meringue method", by putting the egg whites and sugar into the bowl and heat it over the heat until they're hot and the sugar melt, then beat it until stiff. 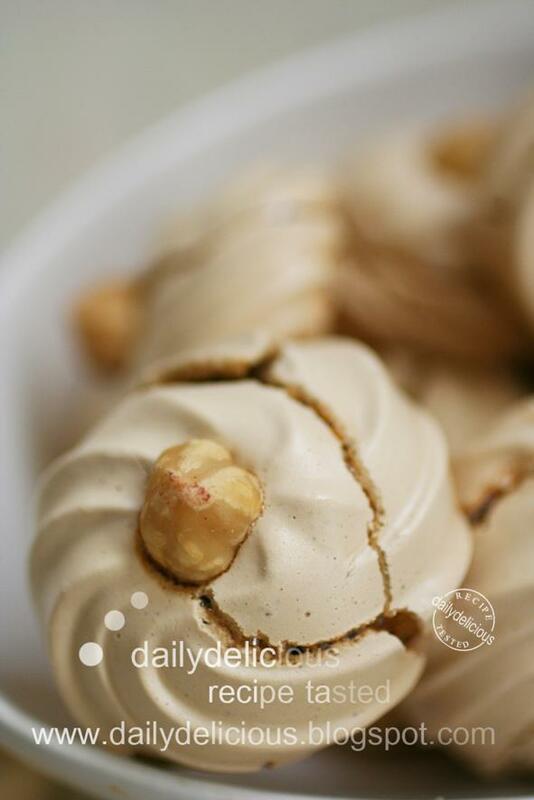 By using this method the meringue will be more stable than French meringues method, and after baking in quite hot than usual oven the meringues will be crisp with a hint of caramel (the sugar will be boiled and turn into caramel inside the meringues). After the first trial, this is my third batch, you can see that I like this meringue very much, and all the people in my family, they LOVE IT! 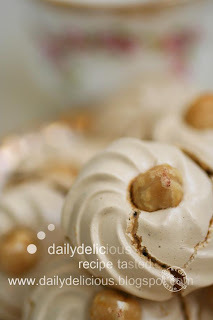 The meringue is great, because the coffee flavor makes the meringues less sweet and the nut balance the meringues with it's crunchiness and richness. 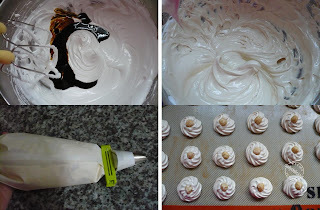 The meringues can be kept very well, if you put it in the airtight container, for up to 2 weeks, so you can make and send them as a gift for your friend. I think your friend will love these cookies, love you and your advantage is you will get rid of the egg whites in your fridge (I know, you have a lot of it too, haha), like I do. Line a baking sheet with parchment paper or a nonstick liner. Spread the hazelnut on an unlined baking sheet. Place in the oven and toast until golden brown, 7 to 10 minutes. Let cool completely. Mix the instant coffee, water and the coffee-flavored liqueur together, set aside. Pour water to a depth of about 2 inches into a saucepan, place over medium heat, and bring to a simmer. Combine the egg whites and sugar, in the stainless-steel bowl of a stand mixer that will rest securely in the rim of the saucepan over, not touching, the water. Whisk together and then place over the saucepan and continue to whisk until the whites are hot to the touch (120°F), about 5 minutes or so. Remove the bowl from over the water and place on the mixer stand. 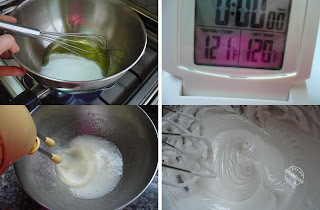 Fit the mixer with the whisk attachment and mix high speed until the mixture is very thick and holds glossy, stiff peaks when you lift the beater. Fold in the coffee mixture. Immediately scoop the meringue into a pastry bag fitted with a ½ inch star tip and pipe onto the prepared baking sheet, forming “kisses” about 1½ inches in diameter and spacing them about 1½ inches apart. Or, you can drop the meringue by tablespoonfuls onto the baking sheet. Place the roasted hazelnut on top of each cookie. Place the baking sheet in the oven and keep the oven door ajar with the handle of a wooden spoon to allow moisture to escape. Bake the cookies until they puff slightly, crack along the sides, and feel dry on the outside but soft to the touch, 40 minutes. Transfer the cookies to a wire rack and let cool. They will keep in an airtight container at room temperature for up to 2 weeks. KITCHEN NOTES: Egg whites will break down in the presence of egg yolk or anything oily, so you must make sure that you clean the bowl and beater thoroughly before starting. Rinsing with hot water with a little lemon juice or vinegar works well. 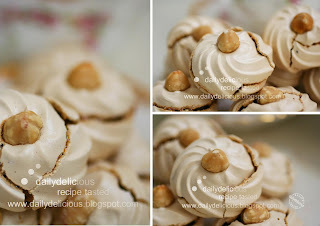 Hazelnut Coffee Meringues, what a great combination! Than you very much for this wonderful recipe!!! The meringues are really good! I made them yesterday and I have posted it here. I don't know why they have that light brown color instead of the pretty beige shade of yours -_-u I'm sure that I used the amount of coffee stated in the recipe so, could it be that I messed something up while whisking the egg whites? Hi. If I don't have coffee liquor, any suggestion on what can I do? You can use 1 tsp of coffee extract with 2tsp of hot water.